Everything has been delicious, and we’ve just about eaten our way through everything already! On Wednesday, the eggs made their debut in ‘breakfast for dinner’ night. Scrambled with a touch of sour cream and some fresh tarragon from the garden… absolutely delicious. Years and years ago, I stayed at a bed and breakfast and was introduced to the scrambled egg and tarragon combination, and it is a good one indeed. If you haven’t tried it, you really must. Absolutely delicious! Tonight, I used up the arugula in one of my favorite recipes: Rice Salad with Arugula, Pine Nuts, and Olives. The arugula was magnificent. It smelled so wonderful coming out of the bag, I just stood there and enjoyed the wonderful aroma! Here’s a link to the recipe and some pictures from tonight’s dinner! 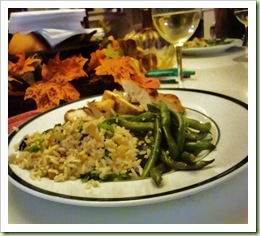 Served the rice salad with grilled chicken and some green beans sauteed with garlic (also farm fresh!) and lemon. And for dessert, well, that was special! Who would have thought that butternut squash could elevate dessert to such dizzying heights? This cake was even better than I expected. I was a little wary at first about adding that much butternut squash… but the cake is just amazing! 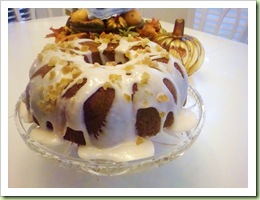 Here’s a picture and the recipe (from FineCooking.com)! The secret to this moist, tender cake is grated butternut squash, which is folded into the batter just before baking. Use the large holes on a box grater to grate the squash.Serves 10 to 12.